There are lots of places online where you can find rare and secondhand books — but one place you should check out if you’re looking for a Harry Harrison book is Fantastic Literature Ltd.
What’s so special about them? They are currently listing hardcovers and paperbacks of many of Harry’s titles, all in fine or very good condition – i.e. never been read – and these books were obtained directly from Mr. Harrison himself. And some of the more interesting items have been signed by the author. Simon and Laraine at Fantastic Literature provide great service – highly recommended. 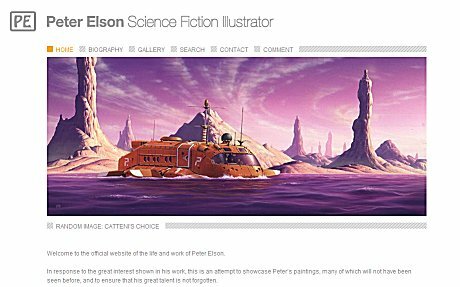 The official website for artist Peter Elson is now online at www.peterelson.co.uk — a huge amount of effort has gone into the site, as the images in the galleries have – where possible – been taken from the original paintings. As well as book covers there is fair amount of previously unseen artwork. Apart from a brief biography of the artist, the site consists entirely of images, which can be viewed in medium and high resolution. There is some really gorgeous stuff there. As well as the Stainless Steel Rat and Deathworld covers, I always loved Peter Elson’s vehicle designs and the painting of the shuttlecraft from 2001. There are covers here I recognise that I never realised were Elson’s work. And there are images which make me want to go out and get hold of the books and read them – which probably the highest compliment you can pay a cover design. Looking at the high-resolution images reminded me of one of the great things about Elson’s paintings, which was that everything was handpainted – all of the textures and the lettering and logos have a handcrafted quality: no Letraset and no computers, and this gives the images a lovely organic feel that is missing from many images we see today. If you have a favourite Peter Elson painting, prints should be available shortly — there’s a ‘contact’ link on the site for making enquiries about prints. The site is the work of Peter’s sister, Pam, and web designer Martin Lucas, who have made a wonderful job of it.